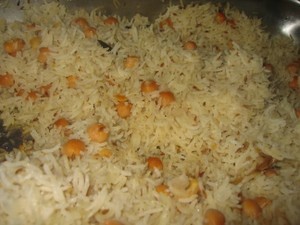 Channa(Chick Peas) Pulao recipe by hotline_hl at DesiRecipes.com. Chana Pulao is a tasty and spicy Punjabi rice preparation with Chana cooked in masala. This dish will surely boost your taste buds. Heat oil in sauce pan and add onions. Add garam masala, cumin seeds , chick peas and fry for few seconds. Now add 6 cups of water and let it boil. Add salt and soaked rice. Let it cook for about 15-20 minutes or until water disappers. Cover the pot and reduce the heat to very low, and cook for 10 min or until rice are cooked. Serve hot. There are 11 comment(s) for this recipe. The chick peas will go in the pot after frying the garam masala and cumin seeds. You have to soak the chick peas over night n then boil it with a pinch of baking soda in pressure cooker from 7_8 mins. You can use canned chick peas if u want to. when do you add chick peas?? receipe not well described. do not know canned chickpes or soaked one. when to add. pls do the needful. never mind the 6 cups of water comment. I read that wrong. it also says to add 6 cups of water for every cup of rice. that cannot be right. And why does it tell you to add the water to the oil and onions? That will splatter everywhere. It doesn't say when to add chick peas an is it whole chick peas or split?